The Prodigal Step | Wir sind bettler. Hoc est verum. 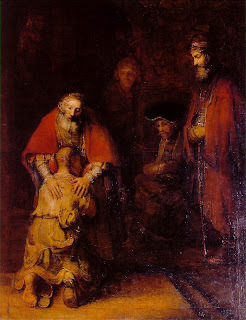 It seems to me that we are one of these 3 figures, the prodigal son, the father, and the older son, at some point in our Christian lives. I think we all start out as the prodigal, we are blatant sinners, destitute and in need of a loving Father and His forgiveness. We know we don’t deserve it, but our Father gives it to us anyways. We ran from Him at one time, and our own brokenness brought us back to Him. Then we become the older son after years of service to our Father, and we become cynical and bitter towards the prodigals He accepts and forgives. We become prideful in our service and obedience to our Father. We forget we were once like those other prodigals (and perhaps at times revert back to be like them for a bit), and think they shouldn’t be treated like we once were. At last as we foster flesh and spiritual children, we become the father of our own prodigals and finally understand more our own Father who forgave us when we were prodigals. We learn what it really means to love and forgive, and what being a father (or mother) really is like. Oh that the prodigals would come home, that the older brothers would be humble, and the Father of our father’s be always the forgiver and lover of His children, that they would be of their’s. This entry was posted in Life Philosophy, Religion on January 13, 2009 by coramdeo.